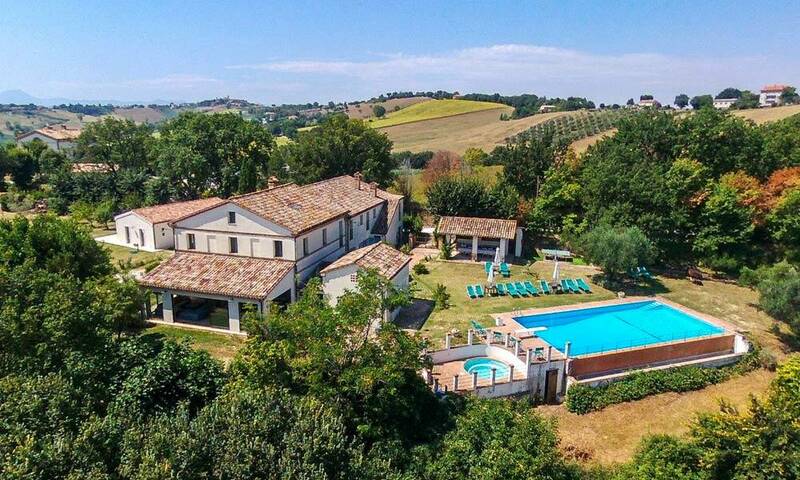 If you are looking for a charming, authentic casale, located a few steps from Corinaldo – one of the most beautiful borghi in Italy – and with a postcard view of the countryside and the borgo, this home has it all. Completely restored with great elegance for style and choice of materials, you’ll immediately feel home, in this cozy property, exquisitely well-finished and maintained. 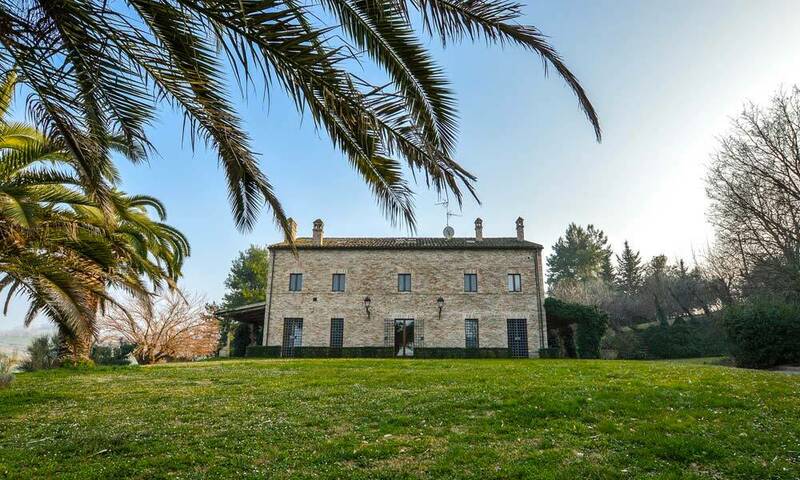 The main building features all the original elements of a traditional marchigiano farmhouse, as brick walls, and cotto tiles, as well as the rectangular shape, now enlivened by the construction of a spacious portico, where you can get some shade and dine out during the hottest evenings. from the main door you step into a hall, leading directly to the sitting/dining room, which is directly connected both to the spacious kitchen and the bright living room by two big squared arches. The arches, give the feeling of being in an open-space and let light pass through the rooms, yet the areas are all separate. From the kitchen you have direct exit out to the portico, so you can comfortably cook and bring food ouside to eat with your family, without walking a long distance. In the sitting room, a French door leads you out to the lovely and mature garden. From the living room, you can get out to an elegant paved patio with central olive tree, where you can sit and relax. The amazing feature of the ground floor is that from each room, you can enjoy a different atmosphere thanks to the many different corners. Also a guest bathroom is placed on the ground floor. this floor is mainly characterised by the different levels where the room are placed, in a kind of game of difference in height. You access the first floor via the original staircase and you land in hallway that brings you to the rooms of this floor: in front of the stairs there’s a bathroom; on the left there’s a spacious bedroom with ensuite bathroom; on the right you enter a delightful lounge from where you reach another double bedroom with ensuite bathroom, a studio (which could be used as a bedroom)and 3rd double bedroom with stunning view of Corinaldo. A small staircase leads up to the mezzanine and to a 4th bedroom. The real beauty of this home is the simplicity of its finishes, made of white walls, creating a contrast with the cotto tiles used for the flooring which, contemporarily, give the whole house a welcoming sense of warmth. The building is south exposed, thus guaranteeing plenty of light all day. The property also enjoys a 54 sq.m. outbuilding, used as a dependance for guests with open-plan kitchen / dining room, double bedroom and a bathroom with shower. A second annex is registered and used as a garage. The roof of the underground garage has been converted into an intimate balcony where in the evening you can admire Corinaldo’s lights. The garden measure about 3.400 sq.m. and it’s very private, which is a real privilege, when a home is so close to a town. The garden is the element with the most spectacular effect, being the result of many years of commitment and dedication of the owners who were able to create green areas with different impact. The garden develops on different levels, like many terraces, each one with different features: the top has been planted with olive trees, the mid level has fruit trees, while the level in front of the house is flat, with well trimmed grass and areas where you can relax, read a book or have a sunbath. The English rose garden gives the property an overall feeling of charm and in the summer the sweet scent of this magic flower will inebriate your senses. Building a pool is possible, you just need to decide whether you prefer to have it closer to the house or on the top terrace, with a magnificent view of Corinaldo. Access to the property is private, via a gate and with 2 parking spaces right outside the gate, in addition to the garage. LAND / GARDEN: 3.400 sq.m.